“This is an important milestone…TV has been a sedentary experience tied down to homes, hotels, offices…myTV unchains Philippine TV and sets it free,” Smart president and chief executive officer Napoleon Nazareno said during the launch. Raymund Miranda, 360media managing director for mobile TV, said the current offering is still the first phase and that more channels will be added later. When asked, he said they may keep the price as is even as they add more channels. During the demonstration for Cebu journalists a few months back, Miranda told me technical limitations will place the channels at less than 20. I wasn’t able to get the chance to ask him again about this during the launch. Danilo Mojica, head of Smart’s wireless consumer division, said the service will spur people to upgrade their handsets to move to the new technology. He said they have aggressive “subscriber acquisition” target, projecting 60,000 to 70,000 users in the coming months. While myTV is touted as a personal TV experience, studies during their trials showed that 46% watched myTV “in a shared environment,” said Miranda. Miranda said he once saw five or six people gathered around one myTV device, cheering on Manny Pacquiao in his most recent fight. Miranda said that with the service, “there is no more prime time” because people can now watch shows whenever they want to. I don’t have access to their studies during the test phase but I think commute hours can become the new “mobile” prime time, if the service takes off. MyTV will initially be available in Mega Manila, Metro Cebu, Davao, Tagaytay, Batangas, and Baguio City. Smart said that Boracay and Cagayan de Oro will soon be covered. The service will be free until Aug. 31 to give subscribers a chance to try it out. MyTV can be accessed using compatible handsets such as the N92 and the coming N77. The service package is available to both post-paid and pre-paid Smart subscribers. Pre-paid subscribers need only to maintain a P1 airtime load and P488 for the the monthly subscription. This will give us “new TV experience”. I hope this will also be soon available in Zamboanga City. My impression is that it won’t be that soon. Their next areas for expansion are Cagayan de Oro and Boracay. Lucky you! You can afford to buy high-end phones anytime 🙂 . The rest of us have to save up for it. As I said in the post the service is P488 a month. If you’re a pre-paid SMart user, you also need to maintain at leat a P1 airtime load. would the smart tv be available on nokia 7710? No. Smart TV is transmitted through a DVB-H network. The Nokia 7710 is not a DVB-H capable handset so it can’t pick up the signal. would d smart TV be available on PDA phones like HP ipaq and O2 XDA II mini Phone? THE FIRST commercial mobile TV service in the Philippines, myTV, may run into trouble with regulators. Officials of the National Telecommunications Commission (NTC) said companies planning to broadcast digital programs to TV sets or mobile devices cannot yet go commercial because the commission has yet to issue guidelines on digital TV programming. The service will only work with handsets that have DVB-H capabilities. As I said, the signal isn’t sent through the telecoms network, it’s an actual TV broadcast. There are non-Nokia handsets, however, that can access the service. I’m a pre-paid user how much is 1 airtime load to watch a TV progran. You can’t subscribe to TV programs, you have to enrol for the whole service. For pre-paid users, it’s P488 a month and at least P1 of airtime load. As a gadget collector, N92 seemed to be one of the best thing ive ever seen!! I am a loner at home and I do have problems with my tv set-up, the signals and a lot more. i am looking forward to buying this phone soon!! Hi.. ill be getting the unit soon from my friend coming from outside the country.. will it work here in phils? thanks.. just making sure bcoz i dont wanna waste my time and money in buying the said unit. is the myTV of smart available in a sony ericsson mobile phone???? u need to attach a special cover at the back of the phone that contains the dvb-h device. cable shows lang ba puede sa MyTV? how about local shows? mag kano ang subscription pag sa province. i have my n77. ok ba yan sa oriental mindoro. how many channels ang mapapanood ko. 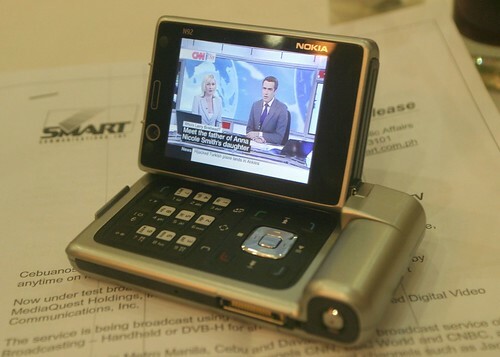 got my n92 and mytv since aug. 2007. free pa yata sya until today (jan. 31, 2008). currently, dey hav 10 channels. mag add pa daw sila ng 4 new channels dis feb. P488/mo., regardless ng place mo as long as my coverage ng mytv sa lugar mo. kaya lang nakalagay sa promo nila, my PBO (Pinoy Box Office) pero wala na sya, Basketball TV na ang pumalit. 1. di po pede n95 sa mytv. n92 at n77 lang po pede sa ngayon. 2. for postpaid consumable, yup! on top sya. P488/mo. 3. wala pa cguro sa mindoro. 5. kung malinaw sya non, mas malinaw sya ngayon. sobra! TV talaga. Bakit ganun di pwede N95. aww…..
pwede ba mag advertize sa mytv phone, TVC? how much ang package? May medical show ba or entertainment show na makikita? Tnx. Well ,Well ,Well, Thats a great idea this is because i have registered my tv in kenya and i want to the first to offer the mobile tv in a big way. Please get in touch. Playing with fire? Painting with fire!